I fell in love with another Trinket Studios game, Color Sheep, at PAX East in 2013. When I heard the announcement for the Battle Chef Brigade Kickstarter campaign, I knew I needed to check it out. So far it hasn’t disappointed. From the campaign video, the game seems to be a cross between Iron Chef, a fantasy hunting game and a magical anime world. 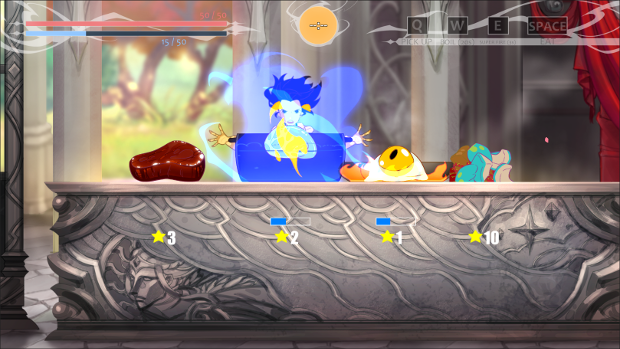 Players will choose their chef, hunt for their ingredients, then create dishes using their culinary skills and spells. Chefs available at launch will include a the fast and fearless woman, Mina, the powerful and bloodthirsty, Thrash, and sly and deadly elf, Kirin. According to the campaign, the team at Trinket Studios has been working on the Battle Chef Brigade with their own funds for over a year. The “biggest remaining tasks are related to our illustrated, hand-animated art style. There are very few shortcuts to creating hand-drawn animations and environments.” If you’re like me and love learning about process, the team is also updating their progress on the game’s dev (development) blog. Backer rewards start at the $15 level for digital download of the game and a thank you in the credits and run through the $2,500 level to be transformed into a celebrity guest judge. At the $45 level, backers not only get access to the beta, but also will also stumble upon in-game backer-only items.